Spells you cast cost 1 less to cast? 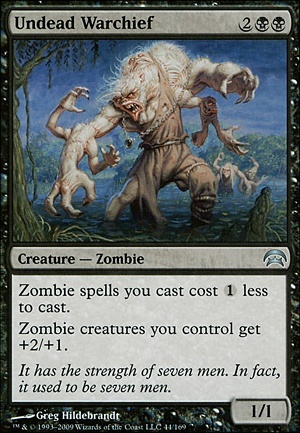 Zombie spells you cast cost (1) less to cast. Major change to the deck. Trying to see if this smooths it out. I play a multiplayer game weekly. The idea for this deck is to draw or search for Gray Merchant of Asphodel . Play Gravecrawler on turn one, turn two Dark Ritual for Phyrexian Obliterator or Culling the Weak for Undead Warchief and recast Gravecrawler from the graveyard. 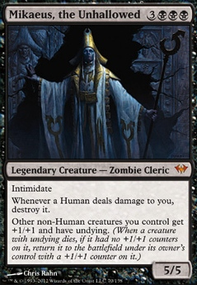 Next comes Midnight Reaper play Culling the Weak or Altar's Reap to draw a load of cards, or Entomb or Buried Alive to put the Gray Merchant of Asphodel into the graveyard then Ghoulcaller's Chant , Ghoulraiser or Zombie Apocalypse to bring him into play. In play testing if I get a really good draw I can play the Gray Merchant of Asphodel twice on turn 5 with a ton of devotion. The guys I play with have some good decks but there are no turn 2,3 or 4 wins. Thanks for looking and suggestions! Also I know it should be 60 cards, still testing to find the right mix. So far my mana curve is a bit wack I think but still a work in progress. I would shy away from Smallpox , since it deprives you of a Swamp. I would go for Syphon Mind , instead. I've never been unhappy to draw it. For the zombie theme, Grave Crawler will also be better for you in this deck than Reassembling Skeleton . You could also include Cover of Darkness and Kindred Dominance . Undead Warchief will help you recast your commander when he is inevitably removed, and powers up your deck, to boot. As for other removal, Something like Festergloom is going to be low-impact, so you'd be better off running Decree of Pain . Hero's Downfall is an easy upgrade to Murder , and Bojuka Bog and Nihil Spellbomb are easily better than Tormod's Crypt and Vile Rebirth . 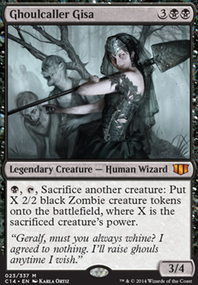 Gate to Phyrexia is a good card to include in mono-black, especially with the ability to churn out 2/2 zombies. As for lands, I'm sure you've already considered it, but you've still got room in the budget for Cabal Coffers . 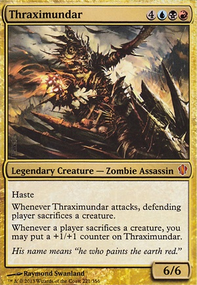 It's never going to be a bad investment with the growing popularity of Commander. I would also go for Shizo, Death's Storehouse . It will be better than Rogue's Passage . You should seriously consider how many non-swamps you want, too, with your commander. What do you have that is going to draw you over seven cards to make use of Reliquary Tower ? Temple of the False God is awful. If you have an opening hand of two swamps and Temple, what do you do if you don't draw a third land? 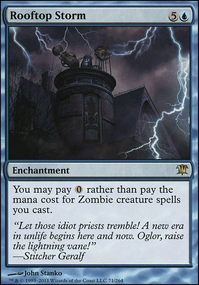 Also, if you're running tutors for your Cabal Stronghold , as often as not, you're going to lose that extra mana by having one less swamp out, anyway. Evolving Wilds and Terramorphic Expanse aren't doing you any favors. The deck thinning is negligible in a 99-card deck, and your commander has built-in flood protection. Also maybe Rewind,Dimir Locket,Sinister Sabotage,Lord of the Accursed,Buried Alive,Grave Titan,Diregraf Captain,Training Grounds,Endless Ranks of the Dead,Undead Warchief,Lich Lord of Unx,Sidisi, Undead Visier,Liliana, Death's Majesty,Death Baron,Liliana, the Last Hope,Dread Summons!Ghoulcaller Gisa,Lord of the Undead,Zombie Master,Geth, Lord of the Vault,Unbreathing Horde,Forgotten Creation,Prized Amalgam,Phenax, God of Deception,Sheoldred, Whispering One,Kalitas, Traitor of Ghet,Thief of Sanity,Burnished Hart,and Traumatize plus some kill spells and more counter spells and you should be pretty close;) Also you maybe should check out EDHREC for some more options.